Preheat oven to 350 degrees. Grease a 13x9x2-inch baking dish. 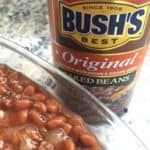 2 Comments on "Better than Bush’s Baked Beans"